Since about two-thirds of the internet by volume are memes, you’re probably already familiar with user-captioned memetic images like Success Kid, Insanity Wolf, Advice God, or Philosoraptor. 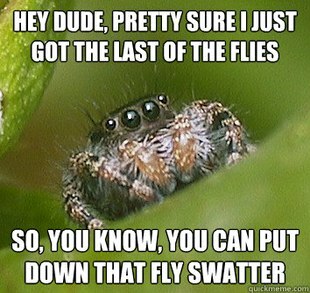 Now there’s Misunderstood Spider, and I sort of want to give him a hug. It’s as if Charlie Brown were reincarnated as an arachnid. There are a couple of pages of the poor little guy over at quickmeme. The site also allows you to add your own captions; if you decide to play along, leave your link in the comments so we can all go admire your handiwork.